As a New Zealand mortgage broker I am interested in things like the national budgets for the reason that they show how the Government of the day plan to use our taxes and also as they have an impact on home owners (and specifically those with mortgages) or those Kiwis trying to buy their first home. We currently have an interesting Government made up of three political parties – the Labour Party, NZ First and the Greens. While publicly the Government is labeled as Labour led, the formation of a this coalition only came about when Winston Peter’s (NZ First) choose to join the Labour / Greens rather than National. It was believed at the time that NZ First members were split on who to support (Labour or National) so with Winston holding the casting vote and effectively selecting who the Government would be he was able to negotiate to have a lot of what NZ First wanted included in the coalition agreement; albeit that agreement has not been made public. Mr Peters said they believed there was a high chance of an economic slow-down and that capitalism needed to “regain its human face”. He said he wanted to address this scenario head-on, so people couldn’t blame NZ First for any economic crash. In actual fact the New Zealand economy has been performing well and running surpluses, so this seemed a weird speech, and many commentators commented that Winston might be pre-preparing the country for lean times due to the spending commitments (promises) he managed to get the Labour Party to agree too. So budget day has arrived after much speculation, promises and hints that promises may not be achievable. This is the first budget presented by a Labour Government in 10-years and Finance Minister Grant Robertson has been quoted as saying that this budget will be “the first steps of our plan to make our economy and communities stronger, more productive, more sustainable and more inclusive” while many critics have questioned the financial management skills of the Labour Party especially when influenced by NZ First and the Green Party. Unfortunately there was nothing much new in the budget for home owners and potential home owners. Rather than giving an overview of the full budget, this financial blog post is focused on what affects house prices, mortgage interest rates and incomes – the key things that matter to home owners and potential home owners. The Treasury forecasts economic growth of about 3.0 per cent per year on average over the period to June 2022. The New Zealand economy is forecast to grow at a rate faster than that expected for our major trading partners. The books are in good shape and on track to meet the Government’s Budget Responsibility Rules with rising surpluses forecast in the operating balance before gains and losses (OBEGAL), reaching $7.3 billion in 2021/22. Improving the Government’s fiscal position makes New Zealand more resilient to future economic shocks and natural disasters. It helps to deal with the costs associated with future challenges such as an ageing population. The Government’s Budget allowances over the next four years and 100-Day Plan spending are about $24 billion higher than planned by the previous government for the years 2018/19 to 2021/22. This represents a 5.0 per cent increase in total core Crown expenses and a 31.0 per cent increase in total core Crown capital investment over the years 2018/19 to 2021/22. It is great that the economy remains in great shape and is therefore providing a higher than expected tax take; however as we have seen in the past our economy is small and can be hit with events out of our control that can have a serious impact on our countries finances – remember recent events like the Global Financial Crisis (GFC) and the two recent earthquakes (Christchurch and Kaikora) and least we forget the Leaky Building saga – all of which have taken a serious toll on finances. If as an individual you had received a higher than expected income (as the Government has) then any financial adviser or budget adviser would be suggesting that you increase your debt repayment and secure your investments, not go on a spending spree. Of course it’s okay to spend a little, but an adviser would be reminding you that income could drop too, and if / when it does you could be in a predicament if you have increased your commitment to spending. For home owners the tax cuts put in place by the previous National Government would have made a huge difference putting extra money in peoples pockets and that would have allowed people to either pay off the home loans faster or save faster for a new home. With that now not happening we were looking for something else in this budget that would help, but apart from the much discussed KiwiBuild there is not much here. The budget has confirmed that KiwiBuild will deliver 100,000 quality, affordable homes throughout New Zealand within a decade. A KiwiBuild unit has been established within the Ministry of Business, Innovation and Employment and has a budget of $2.0 billion with the first houses underway. For those that are not going to be in a position to buy a house then there is more social housing with a promise to to build 6400 more state houses by 2022 at a cost of $3.8 billion (an average of $593,750 each) and $170m for emergency housing plus insulation subsidies for low-income families. I have serious concerns that KiwiBuild will actually deliver what they are promising; that is 100,000 quality, affordable homes throughout New Zealand within a decade – plus this is now old news. They have already told us that the figures that they were working of when they made this election promise were 2-years out of date and therefore the Labour leader Jacinda Adern said just yesterday that a larger KiwiBuild home in Auckland will now be $650,000 and she accepts that at this price a buyer would most likely need a $130,000 deposit. So already the KiwiBuild homes are priced out of the reach of the Kiwi families that the election promise was targeted at. The cost problem is nothing new and as far back as February the Housing Minister Phil Twyford was expressing doubts over the affordability; however they are not yet prepared to accept that this could be a broken promise – a failure. On the Labour Party’s own website today it still says that the KiwiBuild programme will build 100,000 high quality, affordable homes over 10 years, with 50% of them in Auckland. Standalone houses in Auckland will cost $500,000 to $600,000, with apartments and townhouses under $500,000. Outside Auckland, houses will range from $300,000 to $500,000. Something just does add up. There are not the people in the building sector to build the houses. This issue has been signaled even before the election last year when Labour first announced this policy with people saying that “the building industry is under significant pressure and while the industry has the ability to grow its capacity, to insert an additional 10,000 houses on the current level of work out there will certainly be challenging and it will push the industry in some ways into territory it hasn’t been to before” and yet the Government seem to be ignoring this problem so far. No doubt the problem will become real when they actually start building some houses and especially if they get anywhere near the targeted numbers that they are talking about. The problem will then become whether the KiwiBuild project just under-performs or fails, or will we see them just taking staff away from the private building companies and we start to see these businesses in a position where they cannot build houses. Yes, it can be good to hear Governments setting aspirational targets; however there needs to be some reality too. What Will This Budget Do? Unfortunately for home owners and those wanting to buy their first homes there is not much to be happy about. Of course there are winners as there always are when Governments start handing out cash, and with $24 billion higher than planned by the previous government there are some big winners. If you look at Stats NZ they say that the median weekly earnings in 2017 was $959 which equates to an annual income of $49,868. 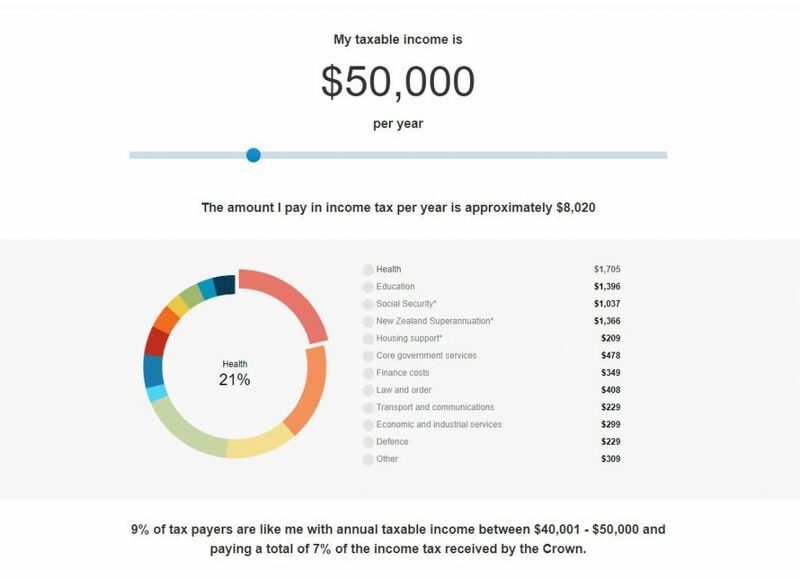 So we plugged that into the tax calculator to see where our tax is spent and the results are quite astounding with $8,020 (16.04%) being paid in tax and of that $349 (4.35%) is used just to pay the finance costs on the money this country owe. That means as a country we are paying more on finance costs that we are on housing support, transport and communications, economic and industrial services and defence. It’s also interesting to see the biggest expenses that we are all paying for. Check out where your tax dollars are spent. No positive or negative impact on home owners or those wanting to buy their first home … yet. The post The 2018 Budget & The Impact On Home Owners appeared first on The Mortgage Supply Company.